Taylor is a high-end brand, so what’s it doing in this price range? This is where their GS Mini Series guitars enter the market. If you wanted your first guitar to be a brand name one or if you’re due to travel the road, Taylor has your back. They, like many other noted brands, see the value and delight they can offer guitar players on a budget. You don’t have to compromise on quality if there’s a Taylor within your budget! Yes, this is a mini guitar, but it’s not going to be as mini as you would think, like for a kid. No, this is more in line with a 3/4-size guitar with its scaled-down grand symphony body. What’s it good for? Uh, everything! It’s a great acoustic guitar for travel that you can take wherever you go. It’s compact, portable, and ready to play in an instant. It has a beautiful solid mahogany top that provides more tonal density than both cedar and spruce. Getting a solid top in this price range is expected, and it’s nice to see that Taylor delivers on quality here. Don’t be surprised if you unbox your guitar to hear bright tones. With a solid top and the more you play, you’ll allow your soundboard to develop deeper tones as it ages. If you want clarity and note-defining punch in your music, you better get good enough to deliver it – the potential is all there. The back and sides are made with 3-layered sapele with a poplar core – so yes, it’s laminate. Although it won’t provide the same acoustic purity as real wood, it allows for a climate-resistant construction and an exotic appeal. The sapele neck also has a genuine West African ebony fretboard with 20 frets and 4mm Italian acrylic dot inlays. Hardware on the Mini consists of a tortoise shell pickguard, die-cast chrome tuners, nubone nut, and a micarta saddle. This guitar is ready to play out of the box. If you’ve always wanted a Taylor, but can’t yet afford one, the GS Mini is the guitar to get now. Even when you eventually get a full-size Taylor, there’s no denying that the Mini may be the one you to turn to for hitting the town or couch-playing in a jiffy! The GS Mini is a fantastic guitar rated by the masses. Its sound is underestimated for a mini guitar as it cuts through thick air with its strong sound projection uninhibited by its laminate back and sides. The quality craftsmanship and solid mahogany top makes for a great guitar with loads of potential. Consistent with the dependable brand, there’s no legitimate complaint on the guitar itself. However, you may come across tuning issues that may indicate the need to focus on the strings as a couple buyers seemed to have issue here. On a new guitar, you may need to replace the strings and/or stretch or bend them to help settle in. A solid top soundboard should also be protected without ever being allowed to dry out. This can cause sound inconsistencies, dull tone, and can warp the integrity of the guitar. To make the most of your Taylor guitar buy, acquire the necessary information to properly look after and maintain your guitar. You might need a setup at a shop if you’re unsure if it’s user error causing the issues or if there’s something that justifies taking advantage of your warranty. If you love the GS Mini Mahogany guitar, but you want to check out some other GS Mini models, look no further. We did a full rundown on the solid top Taylor GS Mini-e Koa guitar. It’s an acoustic electric so you can plug in and jam to your electrical heart’s content. We also scoured over some other Taylor guitars with their grand auditorium bodies. Check them out to see which Taylor is going to be the pick of the lot! But, if it’s the mini size that caught your eye, then you have to stand the Taylor against the LX1 Little Martin guitar. This one has a solid spruce top with mahogany laminate for the back and sides. It’s in the same price range of under $500, and it’s a Martin acoustic guitar. We’re not trying to pit you against the brands, but they’re highly respected companies for good reason. So, are you team Martin or team Taylor? This is Taylor’s term for their laminate construction process. They layer three strips of wood with a poplar middle core that has the desired veneer on each side. What is a Benefit of Laminate on a Guitar? On an acoustic guitar, the benefits of using laminate is obviously keeping the cost of production down to provide an affordable price to the buyer. It also veers away from using real tonewoods that may be listed under CITES. Lastly, laminate is pretty much climate-resilient and more durable than solid wood. It’s durable enough to handle accidental abuse or playing in environmentally-challenging places like at the beach where harsh air and salt water can affect the woods in your guitar. What is a Non-cutaway guitar? A guitar with its traditional and symmetrical shape like this GS Mini is a non-cutaway guitar. A cutaway guitar has a defined cut in one shoulder of the upper bout of the guitar. The cutaway allows for easy access to the upper register and can allow for a more comfortable fit for your body while playing. What is the Difference between a GS Mini and a GS Mini-e? The “e” in Mini-e indicates that the guitar has electric components for plugging in – an acoustic electric. How to pick between the GS Mini models? The easiest way to narrow down which GS Mini guitar is for you is to first decide on if you want acoustic only or pickups to plug in. Once you’ve narrowed down on this decision, it’s then only a matter of what solid top you want. Since laminate doesn’t add to or enhance tonal properties, the solid top options between mahogany, koa, and spruce will be the defining choice. Can the Taylor GS Mini Mahogany be Plugged into an Amp? As it stands, it cannot. It’s an acoustic-only guitar. However, Taylor thought ahead and built in a pre-fitted connecting bracket inside the guitar to install the ES-Go. The ES-Go is a passive magnetic pickup that goes into the soundhole. Use it a V-Cable to control volume right on the cord itself. This pickup was designed specifically for the GS Mini series. However, you could skip the hassle and just go with the Taylor GS Mini-e Koa guitar instead. Does the Guitar have Two Strap Buttons? Conveniently, the mini guitar does have two strap buttons. You just have to provide your own guitar strap and you’re good to play as you pace – or dance! 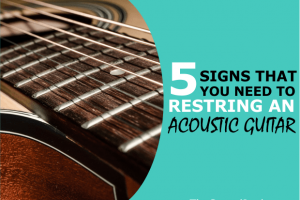 Assuming you want to stick strictly with its acoustic design, you’re going to save more than a few bucks and you’ll need a few more things than just the soft gig bag that it comes with. The bag has decent quality, so that’s one less thing you must purchase. We get into the “needs” and “wants” of guitar accessories in our prioritized list here in our guide, so fingerpick your way over there when you get a minute. In the meantime, here’s a starter list if you’re starting from scratch! To strum it up, it’s obvious you’re getting quite the deal in this price range to get a Taylor guitar. Yes, it may be the GS Mini Mahogany and not a full-size one, but you’ll be surprised at how convenient it is to pick up the mini and head out the door with it rather than a full-on dreadnought. Don’t believe us? Try it out and let us know your thoughts!